He has performed in venues as far afield as the Forbidden City Concert Hall in Beijing – where he gave recitals and a concerto performance of Eric Coates’s Saxo Rhapsody – as well as those closer to home such as London’s Wigmore Hall. Other past highlights include appearances at Brighton, Newbury, Henley, Ripon and Edinburgh Fringe Festivals. His performance of Milton Babbitt’s Accompanied Recitative was broadcast by BBC Radio 3 on ‘Hear and Now’ to celebrate the composer’s centenary. 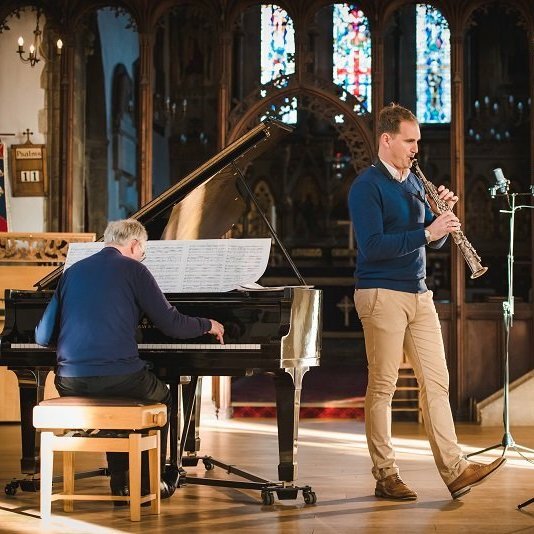 Huw is professor of saxophone at the Royal Academy of Music in London and has given master classes at the Royal Northern College of Music, Chetham’s School of Music, NAFA in Singapore and the Universities of Calgary and Lethbridge in Canada. He has also been a member of the judging panel for major competitions including the Royal Over-Seas League Annual Music Competition. A keen educator, he is also an ambassador for the Henley Music School. In March 2018 Huw featured on ‘BLAKE, The Anniversary Album’, conducted and orchestrated by James Sherlock. Other collaborations include working with singer Laura Wright, harpist Oliver Wass and pianist John Lenehan.